Excellent Big Bang Theory t-shirt! How do you feel about coitus? Dr. Sheldon Cooper would most likely agree with the statement that this shirt is making. What statement is that, you ask? Well, you made need a few advanced degrees in theoretical physics to truly understand, but in layman's terms, it means that you enjoy coitus. Simple enough? 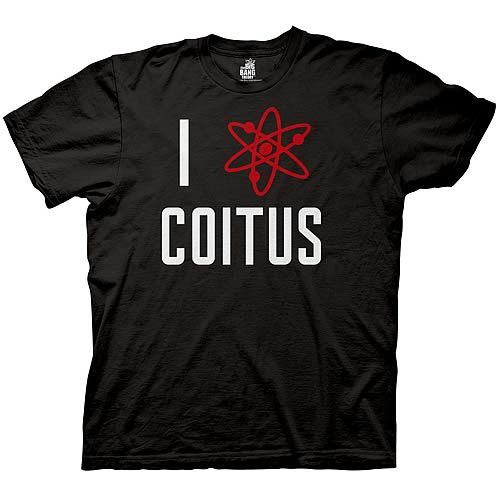 The Big Bang Theory I Science Coitus Black T-Shirt will let everyone around you know, that you science coitus. Bazinga! Huzzah! Hooray! Or any other random interjection containing little or no actual meaning in the English language!